But in truth, members of the Coast Forest Products Association (CFPA) are far from the job creators they could be. While forest industry manufacturing on BC’s coast stagnates, CFPA member companies, including the huge corporations TimberWest, Western Forest Products and Interfor, collectively ship millions of cubic metres of raw, unprocessed logs out of the province each year – a practice the association claims will increase profits which may one day lead to investments in new sawmills. Included in the export mix are logs from old-growth trees harvested on Vancouver Island and Haida Gwaii, the Nass Valley in northern BC, and up and down the province’s coast, including in the Great Bear Rainforest, BC’s much-touted showcase for coastal forest conservation and “ecosystem-based” logging. Since 2013, the year Premier Christy Clark led her government to re-election, nearly 26 million cubic metres of raw logs were shipped from the province, at a combined sales value of more than $3.02 billion. No government in BC history has sanctioned such a high level of valuable raw log exports on its watch or been so mute about the consequences. Last year nearly 6.3 million cubic metres of raw logs left the province. Had those unprocessed logs been milled in BC instead, an estimated 3,650 more men and women could have been working in the province’s neglected forest sector. Moving up the value chain and making even higher value forest products would have added even more jobs to the tally. No government in BC history has sanctioned such a high level of valuable raw log exports on its watch. For more than four years, the provincial government has invested much political capital in a largely failed attempt to create a new Liquefied Natural Gas (LNG) industry in BC – an initiative in tatters with only one company committed to a modest project that may one day employ 100 people. Meanwhile, thousands more forest industry jobs may soon be on the chopping block should the upward trend in raw log exports continue unchecked. Ironically, the location of the promised LNG plant on Howe Sound is near the community of Squamish on lands once occupied by the Woodfibre pulp mill, which closed in 2006. Such an LNG plant would be no replacement for a forest industry that if properly regulated could generate thousands more high-paying jobs in rural communities. Barring changes in government policies, there is every reason to believe that a similar fate awaits other pulp mills and sawmills on BC’s coast, in part because so much of what is logged today never enters a domestic mill. Raw logs are, strictly speaking, forest products, but they are the most rudimentary and lowest value of all products derived from trees. Depending on the age and quality of the log, real value-added would mean transforming those logs into the studs and joists that frame our houses, the floors we walk on or the acoustic guitars and pianos we play. 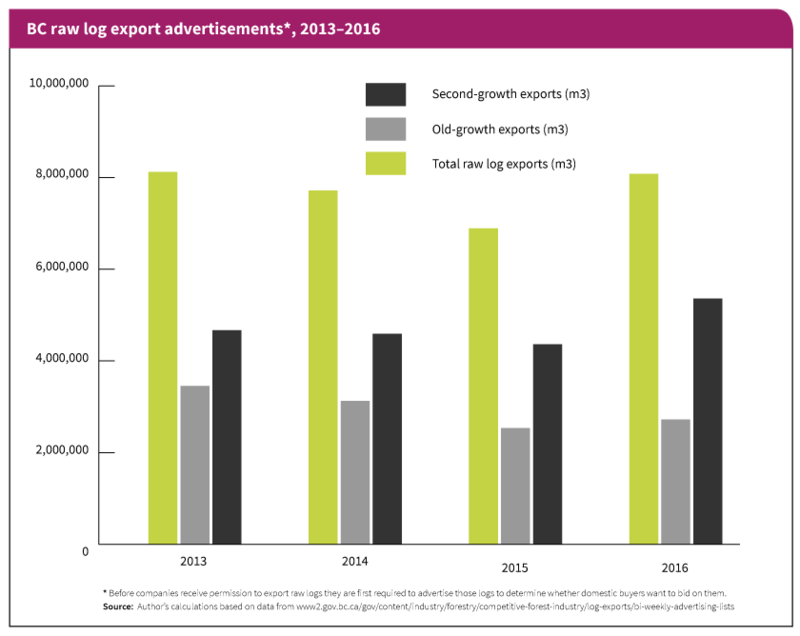 In 2016, log exports climbed more than 6.2 per cent to reach just under 6.3 million cubic metres. The increase meant that well over one in three trees logged on the coast left the province in raw log form. But cubic metres are a rather abstract measurement and don’t convey what is actually at stake with such exports. Consider this: if the raw logs that left BC last year had been used just to make the lumber and other wood products commonly used in house construction, enough wood would have been milled to frame approximately 134,000 homes, or roughly half of Vancouver’s detached housing stock. The 6.3 million cubic metres exported last year also understates what forest companies actually hoped they could ship out of the province. Indeed, BC forest companies initially applied to ship far more logs out of BC than they actually did: nearly 8.1 million cubic metres. If that goal had been realized it would have resulted in at least 4,700 foregone jobs. Thankfully, a few local buyers managed to redirect some of those export-bound logs. As the exodus of this valuable raw commodity continues, rural communities pay the highest social and economic costs, deepening the divide between modest job growth in BC’s major urban centres and declining job opportunities everywhere else. Port Alberni is one such have-not community. The central Vancouver Island town was once a thriving, diversified forest products manufacturing centre. Now, sawmill production is down at least 20 per cent from what it was in its economic heyday in the 1980s and 1990s, the once-thriving plywood mill is gone all together, and pulp and paper production has dropped precipitously – a 57-per-cent fall. The decline in high paying jobs in the once-bustling forest industry highlights a sobering social reality: Port Alberni has among the province’s highest child poverty rates. Keith Wyton is an elected Alberni-Clayoquot Regional District councillor. He also runs a successful value-added outdoor cedar furniture and landscape tie manufacturing facility although the business is vastly scaled down as he nears retirement. Wyton says there is growing unease in the region as local residents worry about the future of the region’s forests and its remaining forest industry. A resolution passed at the annual Union of BC Municipalities convention calling for a ban on logging old-growth forests on Vancouver Island underscored the unease with some residents supporting the call and others not. But no matter what side of the divide Port Alberni residents landed on, Wyton said, no one is happy with the status quo. Vancouver Island’s vastly diminished old-growth forests continue to be logged even as logging of the island’s smaller second-growth trees accelerates. Yet all of that logging is not translating into increased jobs for community members, but rather more raw logs being loaded into the holds of ships anchored in Port Alberni Inlet within eyesight of the town’s mills. The risk, Wyton fears, is that if companies like WFP don’t invest in new mills that can process logs from smaller diameter second-growth trees, the table is set for even higher exports in the future. The large number of raw log shipments that CFPA members are involved in is not something the association boasts about. But data from a provincial government database shows that in 2016 CFPA member companies accounted for nearly half of all the unprocessed logs that companies sought to ship from BC. Of the nearly 8.1 million cubic metres of raw logs that logging companies indicated they hoped to export from the province in 2016, 3.78 million cubic metres (or 47 per cent) originated with CFPA member companies. One of those companies – TimberWest – was by far the biggest player, accounting for 2.03 million cubic metres. Other CFPA member companies of note were WFP, Probyn Log Ltd. and Interfor. Their combined sales notices amounted for another 1.24 million cubic metres. It is likely, however, that these figures do not reflect the true extent of each company’s involvement in exports. For example, WFP has a dedicated “export team”, and in hundreds of entries in a databank maintained by the provincial government the words “WFP Export Team” appears along with another “client” company on export applications. Most of the raw logs exported from BC ended up in China, other countries in the Asia Pacific region or the United States. Mills in the US Pacific Northwest, just across Juan de Fuca Strait from southern Vancouver Island, are among those that receive raw logs from BC. Island Timberlands, which is not a CFPA member company, was second only to TimberWest in its efforts to export raw logs from the province. The company served notice that it hoped to export nearly 1.53 million cubic metres in 2016. Along with WFP, these three companies are the undisputed export powerhouses in BC, accounting for more than half of all log export applications. As the exodus of raw logs continues, employment statistics compiled by the provincial statistical agency, BC Stats, paint a disturbing picture of declines in forest industry employment. In the past 10 years, at least 22,400 people lost their jobs. The largest job losses by far were in manufacturing – sawmills and pulp and paper mills – not in logging, which underscores what is at stake with continued raw log exports. As the exodus of this valuable raw commodity continues, rural communities pay the highest social and economic costs. In coastal BC, not a single new sawmill of note has been built in well over a decade. The Teal Jones Group was the last company to build a new sawmill on the coast, a $30-million venture constructed in 2003. Significantly, this new mill processes smaller second-growth logs, but even with this addition, shipments of second-growth logs dominate the export market. 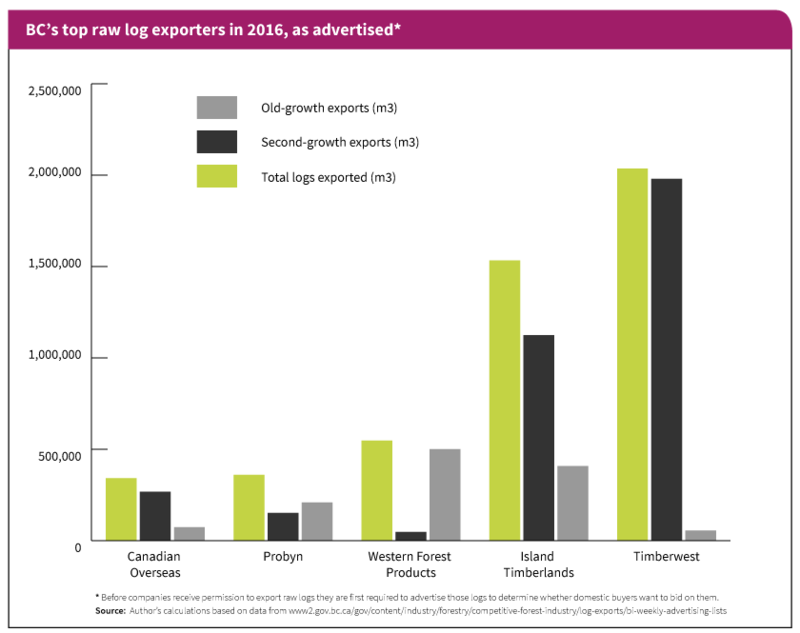 In 2016, BC companies sought to ship nearly five million cubic metres of second growth logs while old-growth raw log shipment applications added roughly another 3.1 million cubic metres to the tally. WFP, coastal BC’s largest lumber maker, has made significant investments in recent years to some of its existing mills on Vancouver Island, improving their efficiency and profitability. Such investments, however, do not represent new mills, which is a critical point. Under existing rules, logs deemed “surplus” to domestic milling needs essentially have the government’s green light for export. This raises a thorny question: If more sawmills close, an eventuality that Wyton foresees as old-growth forests diminish, will log exports climb further still? Wyton’s fear, echoed by many forest industry workers, is that the answer is yes. Nothing will prevent a surge in exports without more investments – and soon – in state-of-the-art sawmills designed for second-growth logs. In the absence of more mills, we can only estimate the effect of raw log shipments from BC on foregone job opportunities. Assuming that enough mills were built to handle the nearly 6.3 million cubic metres of logs that left the province in 2016, and assuming that those mills matched the provincial average in terms of jobs generated per unit of wood, another 3,650 men and women could be working in the industry. More re-cutting of wood into higher-value components would generate even more jobs. Laying the groundwork for getting more mills built is another matter, however. That’s because in 2003, the provincial government abandoned a longstanding policy that required companies logging trees on publicly owned or Crown lands to also mill the trees. In coastal BC, not a single new sawmill of note has been built in well over a decade. The scrapping of those rules – known as appurtenancy clauses – flung the door wide open for companies to close mills without fear of reprisal, a move that was underway before the clauses were abandoned but that sped up dramatically after. Since 1997, an estimated 100 mills have closed in BC. With dramatically fewer mills processing wood, log exports soared. And in recent years, the largest increase in exports has been from Crown lands under provincial government control, underscoring the link between policy choices by the government of former Premier Gordon Campbell and the consistently high level of exports from Crown lands in recent years. Historically, most raw log exports came from private lands, but no longer. In the last five years, approximately 60 per cent of exports originated from lands under direct provincial government control. The remaining 40 per cent came primarily from privately owned lands, largely on southern Vancouver Island. Rules dating back to BC’s entry into Confederation have subjected those raw log exports to federal export regulations. Two companies dominate the log export business on those federally regulated lands – TimberWest and Island Timberlands. The disturbing reality is that these companies are now moving aggressively to dominate exports on provincial lands as well. A “value-added” initiative by one of these companies underscores what may be at risk as the provincial government continues to ignore BC’s languishing forest sector.